Sometimes it is hard to stay focused with all of the lovely commercialism around this sacred holiday. However, thanks to Tip Junkie I was reminded to share a tradition that helps us stay focused on Christ amidst all the hustle and bustle of the season. When I was a kid my mother always had a little tiny manger. 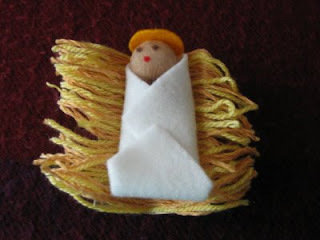 She would cut up small peices of yarn so that it fit perfectly in the manger. Whenever we did something nice for someone or some act of service we coupd add a straw to the manger. On Christmas Eve we always have a Jerusalem supper... with foods that Mary and Joseph might have eaten that night- grapes, figs, dates, cold chicken (but we don't eat it cold) sometimes fish, a cheeseball given us from the neighbors, crackers etc.- and afterwards we all gather around the Christmas tree and read Luke 2. When we have finished we place the baby in the manger, and hopefully he has a soft bed. Sounds like a great tradition! I need to find some more spiritual traditions for our family too! Nick's family writes letters to Jesus each year and puts them in a stocking, then they don't read them until the following year. I love this idea. I've seen it with the hay but I like the yarn better. So I don't know you but I love sharing our family traditions. We do a progressive nativity. After we finish an activity we get to put the related nativity charactor out. Joseph was a carpenter so once the tree is up he comes out. Marie was such a giving person so once we give out our neighbor gifts she comes out. The Shepards come out after we have gone through our old toys and leave them with others, just like the shepards had to leave the sheep. The Angel=caroling or go to a concert. Three Wise Men=looking at lights (following the star). And finally Christ comes out on Christmas morning. One final thing we do, as a count down to Christmas we open a gift each night that has a small treat for the kids and a scripture reference. We read the scripture about a gift that Christ has given us and talk about how greatful we are to have it in our lives. The last gift we open(Christmas Eve) is the Atonemnet. Every year I have done this we end up bearing our testimony of graditude for all we have. Then we pull out our Gift's for Christ stocking and write down a gift we will work on giving to Christ during the up coming year. We pull out our gift from the year before and then put the new one in the stocking. Sorry this is so long I just LOVE all the celebrations of Christ during this season.